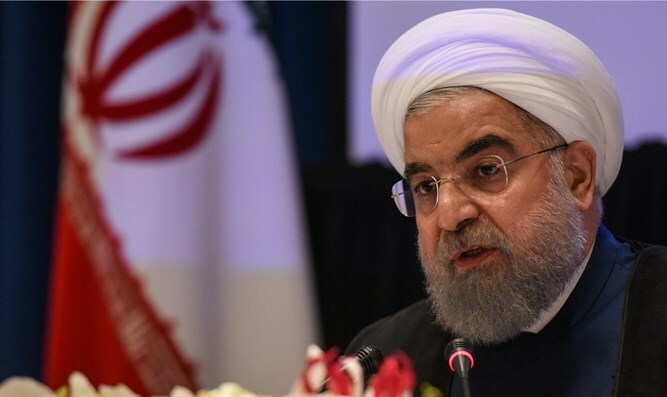 Iran’s so-called moderate president Hassan Rouhani last week labeled Israel “a cancerous tumor, ” claiming that the country was a “fake regime” established by Western countries. Netanyahu also called upon “the nations of the world” to join the new US sanctions imposed against Iran and said the Islamic Republic was also a threat to them. On Sunday, Iranian Supreme Leader Ayatollah Ali Khamenei joined the renewed war of words against Israel. The Iranian leader claimed that “the Zionist regime is clearly weaker than 10 and 20 years ago,” boasting that Hamas and Hezbollah defeated the IDF during the wars in 2005, 2008, 2014, as well as two weeks ago during what he called “the 2-day war” when Iran apparently ordered the Palestinian terror groups to pound southern Israel with 460 rockets. The European Union, in a rare show of solidarity with Israel, subsequently slammed Rouhani’s “cancerous tumor” remark as “totally unacceptable” and claimed it remained committed to the security of Israel, but stopped short of joining the new sanctions against Iran. “The European Union reiterates its fundamental commitment to the security of Israel, including with regard to current and emerging threats in the region,” a part of the EU statement read. As will be become clear from the following, the nations of the world are far from joining the American sanction regime against Iran and are indifferent to developments which prove Iran is steadily preparing for a war of annihilation against Israel. The EU, for example, has done everything to allow European companies to continue doing business with Iran and even updated a “Blocking Statute” to protect European companies from American punitive measures under the new sanction regime. Apparently, it helped, European trade with Iran increased by 7,5 percent in 2018. Some Asian countries are also trying to help the Iranian economy now that the Trump Administration has imposed fresh sanctions intended to crumble Iranian oil exports. India, for example, doubled its oil imports from Iran in October. The value of these imports now stands at $1,42 billion while the Iranian oil imports to the Asian country rose by a staggering 38 percent over 2018. China, furthermore, has resumed its oil imports from Iran after it obtained a waiver from the U.S. causing the collapse of oil prices after they rose 20 percent at the beginning of November. Iran, meanwhile, is steadily progressing with its plan to confront Israel via a three-front-war and to take over Syria. The regime in Tehran continues to smuggle heavy weapons to Hamas and Islamic Jihad in Gaza. Israeli and Kuwaiti media reported on Saturday that Islamic State branch Wilayat Sinai had seized an Iranian shipment of Kornet anti-tank missiles and other GPS guided weaponry bound for the Gaza Strip. Hamas used a Kornet missile to target an Israeli bus which had just transferred a group of 50 IDF soldiers to the border with Gaza at the outset of the missile onslaught that almost caused a new war between Israel and the Palestinian terror groups in Gaza two weeks ago. The ISIS commanders in the Sinai Peninsula are reportedly refusing to hand over the weapons, which could also be used against Israel. Wilayat Sinai shot at an IDF border patrol last week. Then there is Syria where Iran and Hezbollah together with the regime of Syrian dictator Bashar al-Assad are changing the demographic situation along the border with Israel as a preparation for a future war with the Jewish state. The Middle East Media Research Institute (MEMRI) just published a report documenting the silent ethnic cleansing of Sunni Arabs in southern Syria where the Assad regime has forced the various rebel groups into so-called reconciliation deals. Assad has now granted Syrian citizenship to thousands of Iranians and Shiites from Pakistan and Afghanistan who fought alongside the Syrian army during the battles which secured the survival of the regime of the ruthless dictator, and who will settle in southern Syria. The Syrian news site Zamanalwsl claimed that the Syrian government has issued 200,000 passports to members of the Iranian Revolutionary Guards Corps and other Shiite fighters and their families.